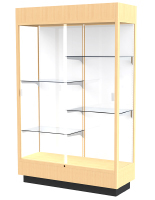 Our rectangular display cases with raised bases are versatile glass towers for any company, school, library, museum, or home. These display cabinets, also known as curio cabinets, can stand either in the middle of a room or against the wall. What distinguishes this line of display cases? The wide base and canopy on these curio cabinets make them look like classy furniture, allowing them to fit in any environment. 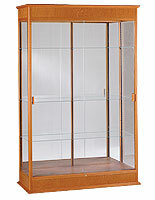 These display cabinets come in a choice of different finishes for accommodating homes, stores and businesses. Tempered glass makes each of these curio cabinets a secure showcase that is viewable from any angle. These display cabinets, curio cabinets, option a wall-independent showcase design. They can be used as trophy cases, antique showcase installations, against-the-wall china cabinets, or museum exhibits! What different types of glass showcases are available? 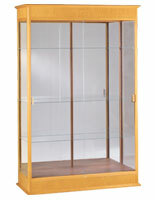 These rectangular display cases come in different measurements ranging from 40" to 75" wide. This means that customers can fill any space with the right cabinet. As mentioned before, these showcases come in a number of finishes, both wooden and metallic. Cases with a maple, oak, cherry and rosewood laminate are available, allowing them to fit in with other natural-looking furniture. For a more sleek appearance, silver and black fixtures are available. While all of these cabinets come with tempered glass shelving, this can range anywhere from (2) to (4) shelves. On most models, these go across the entire width of the fixture, but some units feature an uneven style. In addition, some stands have adjustable shelves for extra customization. With most of these fixtures come with halogen lighting for illuminating curios and other prized items. All fixtures with backlighting at least have top mounted bulbs with a wattage of 20 or 50. Side lighting is found in many models and can be adjusted to aim at memorabilia and heirlooms. All units featured here have locking doors for protecting display items from being stolen or tampered with. These lock and key stands are great for public settings such as schools, museums, offices and stores. Alternatively, home users can be sure that their valuable curios will be safe. With their raised base that adds an extra accent to any room, these display cases are an ideal choice for anyone looking to showcase curios. Fine china, sports memorabilia, merchandise, product samples and collector's items are just come of the items that look great in these floor standing cabinets.